MORE THAN A third of restaurants in tourism hotspots served fewer holidaymakers last year than in 2017, according to the findings of a new State-backed report. The national tourism development agency, Fáilte Ireland, recently published the December edition of its tourism barometer, a survey of roughly 500 industry stakeholders. Although 2018 was a record year for Irish tourism, the findings showed that 34% of respondents working in the food industry alone recorded a decline in the number of tourists they served last year. Some 45% reported an increase in business from both domestic and overseas tourists while 21% experienced no change. 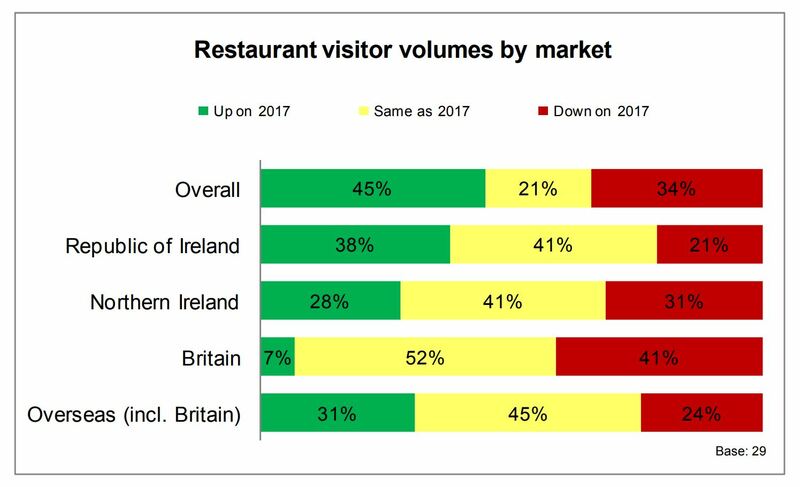 It must be noted that these figures are based on a low base size, although Fáilte Ireland specifically surveyed restaurateurs operating in “areas of high tourism footfall”. According to the report, the sharpest decline was recorded among British holidaymakers, with two in five restaurants seeing a decline in UK customers last year – which comes as little surprise after two years of fluctuating visitor numbers. The State agency said this was offset to some extent by a bump in US visitors – a trend that’s expected to continue in 2019. Commenting on the findings of Fáilte Ireland’s report, CEO of the Restaurants Association of Ireland (RAI) Adrian Cummins suggested the data indicates “an oversaturation of restaurants in the country”. “If numbers of tourists are up and (34%) of people see less tourists, obviously they’re spreading more thinly on the ground,” he claimed. Cummins said that many RAI members that experienced a decline in business last year blamed the issue on an oversaturated market. Across the board, the government’s decision to increase the VAT rate for hospitality businesses from 9% to 13.5% was a big concern. After Brexit, it was the second-biggest worry for tourism stakeholders surveyed by Fáilte Ireland. Cummins – who campaigned against the VAT increase and called for Tourism Minister Shane Ross to resign after the tax hike – suggested the higher levy will create problems for restaurateurs this year. “The Ministers for Finance and Tourism have shot themselves in the foot by increasing the VAT rate at the most volatile time in Irish tourism, with UK visitors hitting the floor,” he said, forecasting “more casualties in our sector very very soon”. A potential fallout from Brexit was the biggest headache for restaurant owners surveyed by Fáilte Ireland, with 90% citing it as a concern for 2019. Apprehension over Britain’s exit from Europe, which is inching closer to a dreaded no-deal scenario, was highest among businesses located in the North. Even so, just under half of restaurants who participated in the tourism barometer said they are anticipating a generally more fruitful 12 months this year. Repeat business and local festivals or events were cited as “key reasons to be optimistic” by over half of those surveyed.